Cebu Pacific Promo Fare 2015: Relax, TICKET, Easy! We're giving you low, low fares this Labor Day! There you go folks! That's 50% OFF the base fare! What a great way to commemorate Labor Day in the Philippines. Take advantage of this Cebu Pacific Promo now! 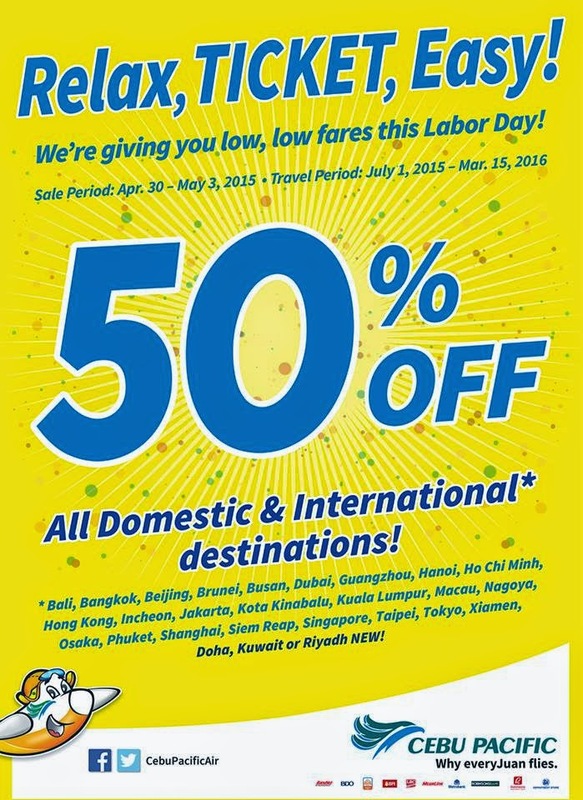 50% OFF is applicable on both DOMESTIC and INTERNATINAL fares only, inclusive of 7 kg hand-carry baggage allowance. The following fees shall apply after discount: Php 120 Web Admin Fee, Php 15 Aviation Security Fee, 12%VAT, Php 50 – Php 220 and Php 550 Terminal Fees for Domestic and International flights, respectively, Country-Specific Taxes ranging from Php 420 – Php 2,195 and check-in baggage. Advertised one way fares have limited availability and are non-refundable but rebookable subject to the following fees: Php 1,200 for Domestic destinations, Php 2,000 for International Short-haul destinations and Php 2,500 for International Long-haul destinations plus fare difference. Please note that booking fee rates range from Php 120 – Php 200 depending on purchase channel. For your convenience, flight changes, availing of prepaid baggage allowance for check-in baggage and web check-in service can be done up to 4 hours before scheduled flight. Hi i want to avail for domestic flight.how can i avail? Manila to Boracay round trip for 2 persons how much.po? magkakaroon po ba kau ng Promo po pa puntang Cagayan de oro to Manila ? hi manila to pagadian city? magkanu po balikan? ang alis po oct 7 at balik po oct13? meron po ba kayong promo on april 2016? may local promo po ba kayo this week for tacloban and cebu for period travel july 2015? International Routes on Promo 2015!